Titanotrichum, which has a single species T. oldhamii, is distributed in southern Japan (incl. Ryukyu Islands), east China (Fujian) and Taiwan. These disjunct populations suggest once much-wider distribution, and the limited locations within which it now grows means that it is vulnerable to extinction in the wild. It is the only genus outside of the New World that produces rhizomes. It grows in shaded areas in valleys, 100-1200m, and can be grown in cool-temperate climates outside. 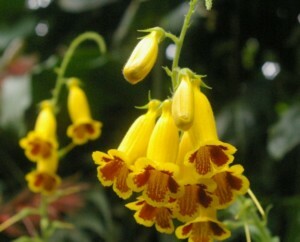 The genus has been placed in Scrophulariaceae, but has been repeatedly regarded as belonging to Gesneriaceae. Wang et al. (1990, 1992, 1998) placed it in the latter family in a tribe of its own (Titanotricheae). Morphological, molecular and population genetic studies based on several accessions from Taiwan, south Japan and mainland China, have been carried out by Wang & Cronk (2003) and Wang et al. (2004a,b). The data suggest that Titanotrichum has to be placed inside Gesneriaceae. It is not related to Old World genera, but has to be included as a tribe of its own in the Gesnerioideae (incl. Coronantheroideae). The single attractive species has been in wide cultivation, but propagation was necessarily through vegetative cloning (cuttings, propagules), as setting seed on the plants was impossible. It turns out that there are other clones in the wild which have been brought into cultivation, and the species is modestly fertile when pollinated by other clones.